NO BALL TICKETS WILL BE SOLD – In the past Sturdivant Hall sold tickets to the Ball to allow non-re-enactor guests, in period dress to attend the Ball. Sturdivant Hall Board decided in 2012 it could not sell these tickets. Commemorative Glass – Society Members will also receive a commemorative glass at no charge. Join the membership of April 1865 Society today! To download a membership form, click here. The 152nd anniversary of the Battle of Selma Re-enactment would not be complete without a Grand Military Ball. This year the “April 1865 Society” has taken measures to ensure that this year’s Ball be truly a step back in time. The Ball will be held at Sturdivant Hall. Sturdivant Hall’s architect, Thomas Helm Lee, incorporated unique and beautiful features in the design to make it one of the finest houses in the Southeast. It provides The Battle of Selma Re-enactment’s Grand Military Ball with perhaps the best setting for this type of event in the country. Ceremonial Ball Guards will be posted at the entrances of Sturdivant Hall. Flags will hang from the Balconies. The receiving line will begin at 7pm where ball goers will be announced and be welcomed in Mr. Sturdivant’s name to the Hall by the commanding Officers and their wives all dressed in their finest 1860’s formal attire. The bands will play in the main courtyard. Only registered re-enactors[with Ball Pass] and April 1865 Society, Inc. members may attend the Ball. All must be dressed in period clothing. 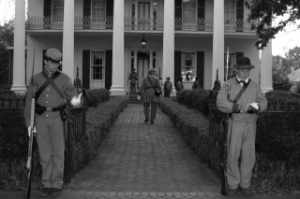 Events like the Battle of Selma Ball and Landmarks like Sturdivant Hall can help bring us back in time to remember the history of our City, State and Nation if only for an evening. This is a family friendly event featuring live music from the 1860’s, ladies in lavish ball gowns, gentlemen in their nicest gloves, and a community coming together and entertaining several hundred out of town 19th Century “guests”. Hospitality written large! Beginning in 2013 no tickets will be sold. Only registered re-enactors and April 1865 Society Members may attend. If you are not a member, we encourage you to join by downloading the membership form by Clicking Here. Period Dress is still required. All Gentlemen regardless of age will wear coats. If a male child is is too young to wear a coat, a night dress would be appropriate. All children under the age of 14 years must be accompanied by a parent or guardian.